"The SimpleOne no-touch automatic hand soap dispenser helps eliminate the millions of germs that your hands can pick up each day. It automatically senses hands and dispenses just the right amount of soap. Hand washing is one of the most important things you and your children can do to help you stay healthy and with the SimpleOne touch-free soap dispenser, you and your family will never have to touch a dirty or germy soap pump again. No more gummy sludge from soap bars to clean from the sinks or soap dishes. 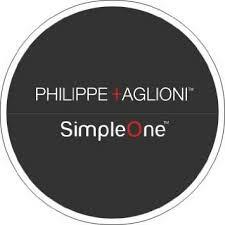 The SimpleOne automatic soap dispenser is ideal for use in the kitchen or bathroom. SimpleOne soap dispensing pump uses Infrared Sensor Technology to ensures a consistent and even amount of soap every time. Save money by using any refill soap of your choice - works with liquid soap, shampoo, kitchen hand soap, foam soap and hand sanitizer." 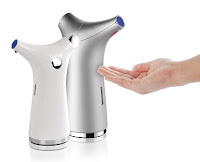 I was sent the Automatic Touchless Soap Dispenser in white from SimpleOne to review. This package arrived safely to my house. There were not any issues during shipment. The soap dispenser was packed nicely and securely inside of a flip top box with a locking tab. The front of the box labels the product and brand. It also provides a very nice picture of the dispenser. The back of the box outlines six features of this dispenser. You can also find the manufacturer's information here, and copyright information. The top of the box has a picture of the designer and a quote from him. As I mentioned earlier, this box has a locking tab on it. Inside of the box, you will find the soap dispenser wrapped in protective bubble wrap as well as an instruction manual. This is actually my second automatic touchless soap dispenser, so I already knew what I was getting into. These are definitely my favorite method of applying handsoap whether it be in the kitchen or bathroom. In my kitchen, I have the Bath & Body Works one that they came out with pretty recently, and it has been wonderful. What I really like about this one is that you can even use this one with hand sanitizer, so you can essentially put it right next to the one that you have soap in. This dispenser looks pretty fancy. You do need (4) AAA batteries, and as you can tell from the picture, I dug some out of my battery arsenal. The soap dispenser also has a branding label on the front of it. Provides the perfect amount of either soap or sanitizer. Able to use either handsoap or hand sanitizer. I haven't found any cons of this soap dispenser. This is just the coolest bathroom device ever. I was so excited to try this—I have been using the ‘ol Softsoap manual dispensers for as long as I can remember. This is DEFINITELY an upgrade! Right off the bat, I love the fact that it’s touch-less. When you think about how many people press the pump handle on a manual dispenser it’s kind of gross, right? Not anymore! I was very happy with the amount of product dispensed as there was a nice amount with zero waste. Nothing extra dripped out or accumulated near the dispenser. The motion portion worked perfectly, too. I wasn’t sure if the dispenser would go off if I was just standing in front of it, but it didn’t. I actually had to put my hand directly under the dispenser for it to work. I’m very happy with this, as are all of the guests that have been using it. I definitely recommend this! Are you wanting to try the SimpleOne Automatic Touchless Soap Dispenser, too? Click the link below, and order away! I love how easy it is to use soap like this. Thanks for telling us about this product!